Solo un buen quote para terminar el dia. 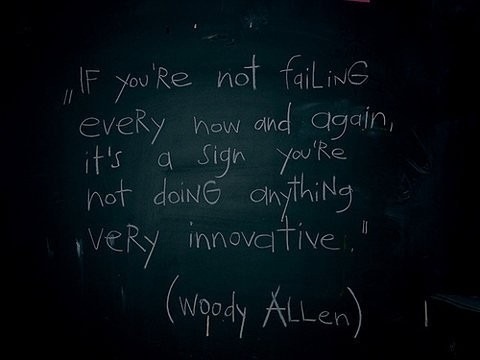 “If you’re not failing every now and again, it’s a sign you’re not doing anything very innovative” – Woody Allen. “Si no estas fracasando de vez en cuando, es una senal de que no estan haciendo algo muy innovador” – Woody Allen. Me parecio una de esas frases que nos dan animo cuando muchas veces fallamos en nuestro trabajo. Quiza se aplica perfectamente a la historia de Norm Larsen, el creador del aceite WD-40, cuyo nombre lo dice todo: “Water Displacement – 40th Attempt”. This entry was posted on March 15, 2011 at 11:59 pm and is filed under Innovation with tags Business, Innovation, Quotes. You can follow any responses to this entry through the RSS 2.0 feed. You can leave a response, or trackback from your own site. And sometimes, we really need this kind of phrases. Thanks, Edwin! Nice to see you around!! muy cierto @hkadejo! gracias por tu aporte.